Hello everyone, here are some quick stats about the teams qualified for the Mid-Season Invitational tournament. This datas come from the Playoffs results of each region and the IWCI for Besiktas. Keep in mind the winrate of each teams when you look at the others stats. It’s easier to have a good KDA when you are 9W-1L than 9W-4L for example. Based on these stats, AHQ looks pretty strong, but we all know stats are not everything in LOL. Edward Gaming won the LPL Playoffs with worse stats than LGD Gaming. And the teams didn’t face the same opponents. Maybe AHQ is really strong or maybe the others LMS teams are weak : make your choice. Even with a 85% winrate, Besiktas eSports Club seems to be behind the others teams. 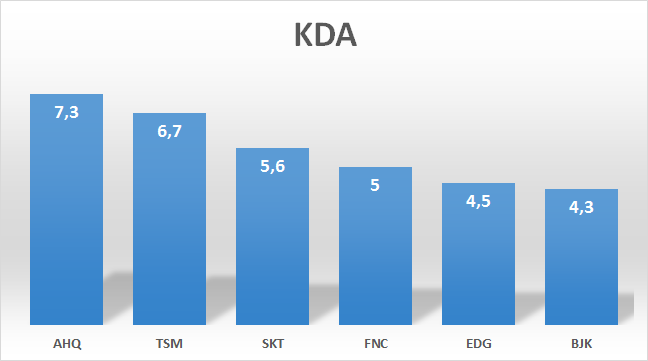 When we look at the farming graph, SKT T1 looks really strong, but overall I think the teams are really close. The winning factor may be something else : teamplay, players skills, timing … Anyways I’m sure we are going to see some incredible games.